Many businesses might think that getting their employees involved in wellness is not part of their business. Wrong. The health of their employees affects their profit in three ways: (1) Healthy employees are often the most productive employees. (2) Unhealthy and employees who smoke are often the least productive. (3) The cost of health benefits for health insurance (i.e. sickness care) now exceeds profits for most large businesses. Moreover, busy employees typically look to their employer for their health benefits, and they expect any treatments to keep them healthy to be offered and paid for by their employer. There is an emerging “wellness industry” offering products and services to keep employees healthy, to slow the effects of aging, and to prevent diseases from developing in the first place. These include programs for weight loss and smoking cessation. The federal government now allows employers to provide tax-free wellness care (e.g., weight loss and smoking cessation programs) to their employees through HRAs, or Health Reimbursement Arrangements. In addition to saving the company money in the long run on sickness expenses, employees who successfully take advantage of wellness programs will likely be more loyal and will thank their employer for the rest of their lives, as will their coworkers and family members. Every employer encouraging employees to choose high-deductible and/or HSA-qualified health plans could have a wellness HRA offering first-dollar coverage for wellness items ranging from annual physicals to obesity treatment programs—doing so will encourage the employees to stay healthy, keep them from skipping important screening items like mammograms, and save their employer and them thousands on future major medical expenses. 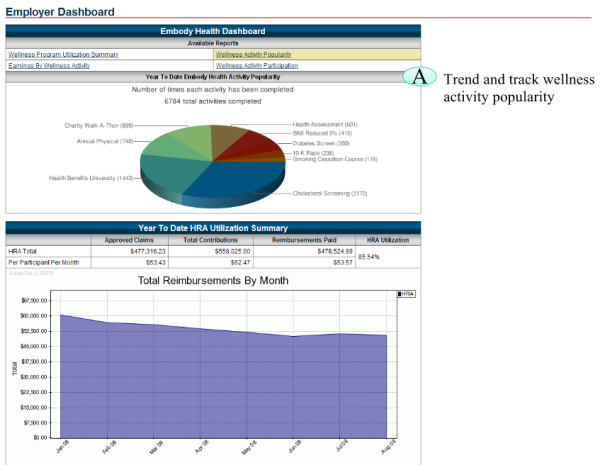 Here's an old screen shot of our wellness HRA dashboard to give you an idea of how this might work.